Tochal Telecabin is probably the world‘s longest gondola lift lines with a length of 7500 m. The project started in 1974 and has been open to the public since 1978. 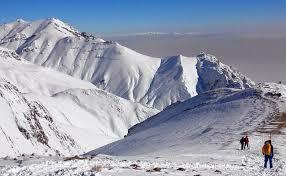 It starts at the Velenjak valley in north of Tehran at an altitude of 1900 m. and ends at the last station at an altitude of 3740 m., near the main ridge of Mount Tochal. This gondola lift is used for accessing ski resorts and other recreational centers on the mountain. Beautiful landscape, mountain fresh air and a multitude of fresh water springs ads to the freshness of the area. With upgrading the safety standards of telecabin lines, families and sports people can enjoy the telecabin ride and other facilities with joy and pleasure. The gondola lift has four stations: Station 1 is at an elevation of 1900 m. and located at the beginning of Velenjak valley (end of Velenjak Street). Parking, inns and some other facilities are available. Station 2 is at 2400 m. and has very limited facilities. Station 5 is at 2935 m. There is a restaurant and a rescue center. This station is in the middle of one of the ski slopes which is open only in mid-winter but rarely used. This station is also accessible through several climbing paths like Shirpala shelter, Osoon valley and Palang-chal shelter. In order to get to Station 7 you have to change here. Station 7 is at 3740 m. and very close to the Tochal main ridge. It is the last station of the gondola lift. This station is in the middle of the Tochal ski slope. The Tochal main peak is a 30-minute walk from this point. This station is also reachable from Hezar-cham climbing path from Station 5.